The indigenous Choctaw Indians occupied the Delta region for hundreds of years prior to the arrival of European settlers, with ancestors stretching thousands of years into the past. The first removal treaty carried out under the Indian Removal Act was the 1830 Treaty of Dancing Rabbit Creek, by which the Choctaw ceded about 11 million acres of the Choctaw Nation (now Mississippi) to the United States in exchange for about 15 million acres in Indian Territory (now Oklahoma). Benjamin Grubb Humphreys, a state senator from Claiborne County, Mississippi, is credited with the founding of Itta Bena. Following several crop failures in the 1850s at his home in Claiborne County, Humphreys took a trip by river steamer up into the Yazoo wilderness to look for a new farming opportunity in the former Choctaw area. He found such an opportunity on Roebuck Lake, a stretch of old channel that the river had discarded a few miles west of Greenwood, in what was then Sunflower County. Bringing a group of slaves up from his plantations during the winter, when boats could use high water to pass from the Yazoo into Roebuck, he directed them in clearing timber and brush from the overgrown bottomland to develop agricultural fields for cultivation of cotton. Longtime Claiborne County friends became interested in his project, and others began to acquire land in the area two years later. Humphreys had established a permanent winter residence, "Lucknow", in Claiborne County. He did not bring his family to his Itta Bena plantation until slaves had completed construction of a substantial home in 1857, which he christened as Itta Bena, the Choctaw words for "camp in the woods". It was built from lumber from the land of the plantation, logs which were plastered and painted. The earliest substantial home built in the frontier Yazoo country, it was the center of the plantation’s many hundred acres. The main portion of the original Humphreys home was still used as a residence in 1954 (thought to be the home of Dr. B. B. Harper on Lakeshore Street). Following the Civil War, Humphreys was elected as governor of Mississippi. 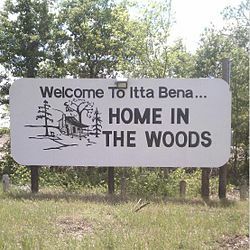 As other settlers moved into the area, the village that grew up around the plantation was also called Itta Bena. Planters used the Yazoo River to ship cotton downriver, ultimately to New Orleans for transport to markets in the United States and Great Britain. Cotton continued as the commodity crop and the source of local wealth after the American Civil War. Construction of the Columbus and Greenville Railway, begun in 1888 and serving the village, stimulated trade and growth. Among the first to build stores were J. B. Humphreys, P. Cohen, and Uriah Ray. The first store was operated by H. M. Weber and a man named Long. The town’s first school, a one-room building only for white students, was built in 1888 and Emma Cross served as the first teacher. Development of the growing city continued in the early 20th century. The first high school was erected in 1905, across from the present-day First Baptist Church. The post office in Itta Bena was opened in 1918. The white minority dominated politics and the economy, as the state legislature essentially disenfranchised blacks by the constitution of 1890. Working as sharecroppers and tenant farmers, they had difficulty getting ahead in the agricultural economy. During the 20th century, many left the county for work in industrial cities of the north and midwest, in the Great Migration. On a march in 1966 between Itta Bena and nearby Greenwood, coordinated by the SNCC but led by Martin Luther King, Stokely Carmichael coined the rallying phrase "Black power!". Byron De La Beckwith, widely known at that time as the murderer of Medgar Evers (although he had been acquitted of charges), drove his truck by the marchers three times while the local police looked on. The city reached its peak of population in 1980. Population has declined since then, reflecting limited opportunities in the rural region. The population has decreased more markedly in the county outside the city, as agricultural jobs have been reduced. As of the 2010 United States Census, there were 2,049 people residing in the city. The racial makeup of the city was 89.2% Black, 10.1% White, <0.1% Native American and 0.1% from two or more races. 0.5% were Hispanic or Latino of any race. As of the census of 2000, there were 2,208 people, 763 households, and 559 families residing in the city. The population density was 1,541.5 people per square mile (596.2/km²). There were 797 housing units at an average density of 556.4 per square mile (215.2/km²). The racial makeup of the city was 81.34% African American, 18.16% White, 0.23% Asian, and 0.27% from two or more races. Hispanic or Latino of any race were 1.54% of the population. There were 763 households, of which 38.9% had children under the age of 18 living with them, 32.6% were married couples living together, 35.4% had a female householder with no husband present, and 26.7% were non-families. 24.0% of all households were made up of individuals and 12.8% had someone living alone who was 65 years of age or older. The average household size was 2.89 and the average family size was 3.43. In the city, the population was spread out with 33.3% under the age of 18, 11.7% from 18 to 24, 25.6% from 25 to 44, 18.3% from 45 to 64, and 11.1% who were 65 years of age or older. The median age was 29 years. For every 100 females, there were 82.2 males. For every 100 females age 18 and over, there were 71.4 males. The median income for a household in the city was $20,968, and the median income for a family was $24,271. Males had a median income of $21,917 versus $16,136 for females. The per capita income for the city was $11,132. About 29.5% of families and 34.5% of the population were below the poverty line, including 43.1% of those under age 18 and 33.1% of those age 65 or over. Mississippi Valley State University is located 1 mile (1.6 km) northwest of Itta Bena in unincorporated Leflore County. It was the state of Mississippi's black vocational college before educational segregation ended. Jerry Rice, widely considered one of the greatest American football receivers of all time, spent his college days playing for the university's team. The Delta Devils play at Itta Bena's 10,000-seat Rice–Totten Stadium. The City of Itta Bena is served by the Leflore County School District. Public schools in Itta Bena include Leflore County Elementary School and Leflore County High School. Marion Barry, civil rights activist, city councilman and former mayor of Washington, D.C.
James Bevel, civil rights activist. Robert "Big Mojo" Elem, Chicago blues bass guitarist and singer. Katie Hall, U.S. Representative from Indiana; attended Mississippi Valley State University in Itta Bena. Luther "Guitar Junior" Johnson, blues musician. B.B. King, blues musician was born near Itta Bena in 1925. Lewis Nordan, author grew up in Itta Bena. Pervis Spann, broadcaster and music promoter. ^ Garrow, David J. (1986). Bearing the Cross: Martin Luther King, Jr., and the Southern Christian Leadership Conference. HarperCollins. ISBN 0-06-056692-2. (available at Google books). ^ "Location Archived 2012-06-03 at the Wayback Machine." Mississippi Valley State University. Retrieved on April 5, 2012. ^ Doc Rock. "The 1970s". TheDeadRockStarsClub.com. Retrieved 2014-01-29. ^ Janofsky, Michael (September 14, 1994). "The 1994 Campaign: The Comeback Man in the News: From Disgrace to 'Amazing Grace': Marion Shepilov Barry Jr". The New York Times. ^ "Robert "Mojo" Elem - Biography & History". AllMusic. Retrieved 2 November 2017. ^ "HALL, Katie Beatrice, (1938 - 2012)". congress.gov. Retrieved 2018-11-13. ^ Troupe, Quincy (June 4, 1958). "BB King: American Blues Musician, b. 1925". Jazzandbluesmasters.com. Retrieved February 17, 2010. ...was born on a cotton plantation, in Itta Bene [sic], Mississippi, just outside the delta town of Indianola. ^ "Pervis Spann Biography". TheHistoryMakers.com. 2018-11-13. This page was last edited on 16 January 2019, at 20:16 (UTC).